The big piece of news this week, as reported by Mike Rogoway in The Oregonian, is the potential for another big Intel investment as they look to increase capacity and develop the next generation of chips. As I mentioned to Mike, this is great news for the regional economy for a number of different reasons. First, Oregon will see a large investment and construction boost just as the economy is slowing down. This is something the rest of the country will not experience; as such it should help maintain our stronger growth a bit longer. Second, and more importantly from a long-term perspective, this proposed investment and expansion signals that Oregon will remain the home to significant, cutting-edge R&D operations for the foreseeable future — in the case of high-tech this means at least the next 5-10 years. Oregon’s high-tech manufacturing sector has not increase employment since the dotcom crash and is not really expected to either in the future. Our office’s forecast calls for stable employment overall, as some of the firms, like Intel, expand and some of the older tech manufacturers cut back. This is largely due to the high productivity of the industry, where investment and innovation increase but employment does not. That said, Oregon’s tech manufacturers remain an economic pillar of our region and we continue to see a shift in the types of jobs the sector employs. Currently, 43% of these jobs are in engineering, computer science, and software-related occupations. Another 18% are made up of managerial, and business and finance occupations. Taken together, 60% of Oregon’s tech manufacturing jobs are white collar, professional types. Production occupations — the workers who actually make things — account for just one out of every four jobs today. This breakdown may be surprising, but is the continuation of trends we have seen in recent decades. Among our tech manufacturers, all of the growth in employment in the past 30 years is among these white collar, managerial and engineering types. The local impact in terms of R&D, innovation, patents and the like is also driven in large part by these jobs. They are also very high-paying as the overall sector’s average wage in 2017 was $126,000, or more than twice that of the statewide average. Now, production jobs within tech manufacturing have held fairly steady since 1990, but have certainly not seen similar growth. It should also be noted that these production jobs, like production jobs in other sectors, pay an average wage of $40,000 per year. As discussed before, there is no longer a manufacturing wage premium relative to other industries, even within high-tech. All of this brings us to a larger point about manufacturing jobs today compared to decades past. I was talking with Ron Fox, then the executive director of SOREDI, a handful of years ago. Ron wanted someone to make a manufacturing jobs poster to show high schoolers how the industry has changed. The poster would have two pictures on it. The first would be calloused, greasy hands to represent manufacturing jobs of the past. The second would be clean hands at a keyboard to represent the manufacturing jobs of the future. Ron’s keen observation of the evolving manufacturing sector is correct. 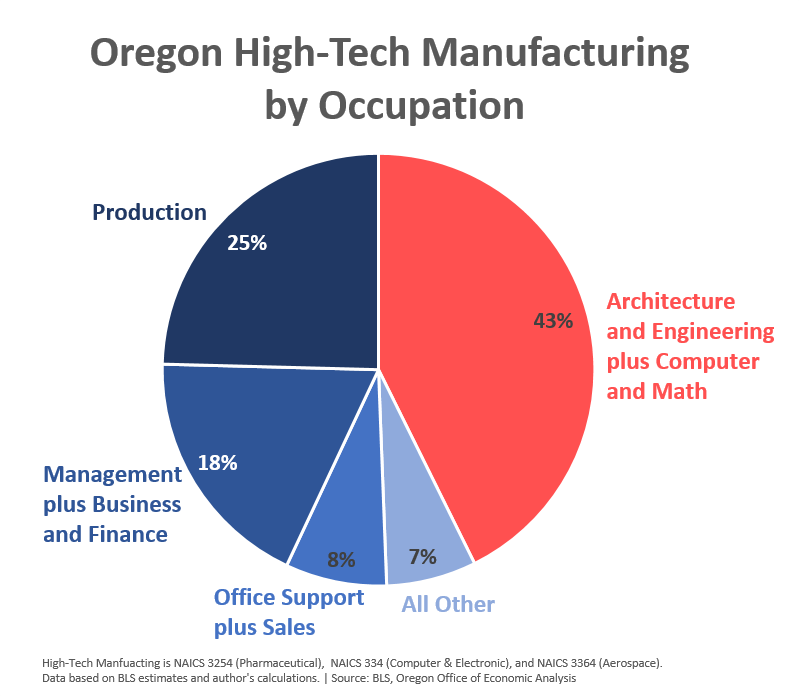 Today in Oregon there are nearly as many of the white collar, managerial and engineering types of jobs in manufacturing as there are production jobs. We have seen a big shift over the past 50 years. And more to Ron’s point, the type of work done by those working in production occupations has shifted as well. The work is more computerized and less manual, although not entirely so of course. Now, there a number of caveats and facets to this discussion. First, the stagnation and decline of production jobs in Oregon and across the country is a problem. See our job polarization report for more. Second, a good chunk of the trends above can be explained by what our office calls The Changing of the Guard in Oregon’s economy. This refers to the fact that the rise of Oregon’s high-tech sector has nearly perfectly offset the decline of the timber industry. (Not that it was harmless, just that the two sectors’ trends have offset.) We can see this in the chart above as well. Roughly half of the white collar job gains statewide are due to the tech manufacturers and much of the production and all other employment declines are tied to the timber industry (all other includes loggers and truck drivers who work directly for manufacturing firms and not third parties). 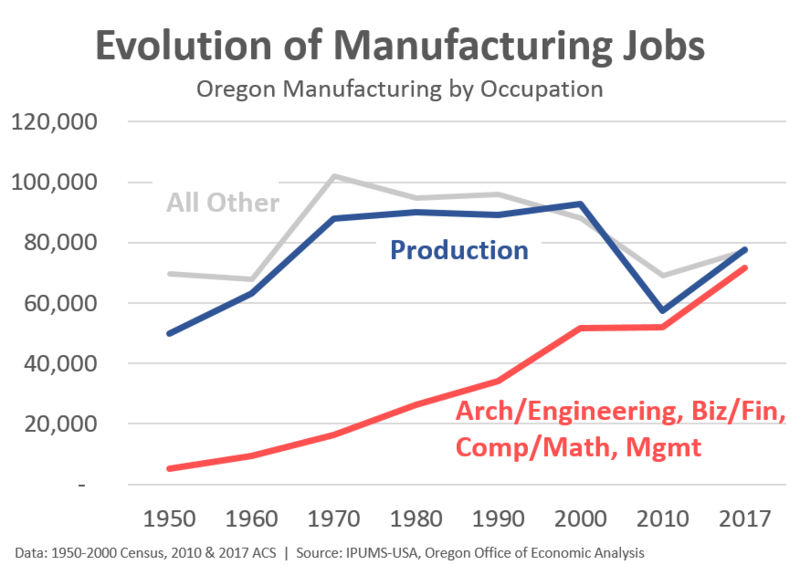 All of that said, the rise of the white collar manufacturing jobs is still seen among Oregon’s non-tech, non-timber manufacturers as well. Back in 1970, the managerial and engineering type occupations accounted for 10% of all non-tech, non-timber manufacturing jobs statewide. Today they have more than doubled in absolute numbers and account for 25% of these manufacturing jobs. Bottom Line: Even as the economy overall continues to evolve away from manufacturing and into services, there is a stark evolution taking place within manufacturing itself. White collar, managerial and engineering type jobs are on the rise, through good economic times and bad. This growth is good news for our regional economy, from an employment, wage, innovation and R&D perspective. It also shows how the U.S. and Oregon are growing the portions of the value chain where we have a competitive advantage relative to the rest of the world. That advantage is not in the low-cost, mass production of products, but in the development process. That does not mean that the stagnation and decline of production jobs in the U.S. and in Oregon is costless because it certainly is not. Even if on net the good outweighs the bad, there are localized impacts on regional economies and among certain types of workers.